Riviera Nayarit Mexico Blog: The Recommendations for the Riviera Nayarit Keep On Coming! The Recommendations for the Riviera Nayarit Keep On Coming! This time the international guide www.societeperrier.com recommends Platanitos and the Marietas Islands among its “five beaches to discover on the Pacific coast” of Mexico. 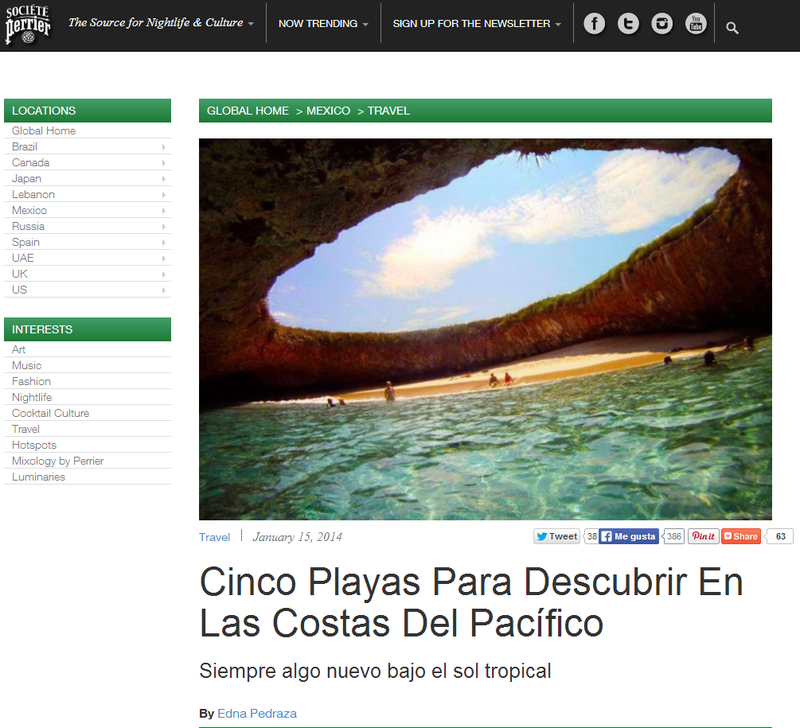 A new recommendation for the beaches of the Riviera Nayarit is circulating throughout the Internet! This time the kudos come from the website www.societeperrier.com, which focuses on international music, art, travel, nightlife, cocktail culture, mixology, fashion and global interests. The article, written by Edna Pedraza—designer, fashion coordinator, contributor to MEOW and editor of Société Perrier Mexico—, extended an invitation to “five beaches to discover on the Pacific Coast.” The list includes Platanitos and the Marietas Islands, both in the Riviera Nayarit. “On this occasion we’d like to mention five tropical paradises that aren’t as well known. They’re bathed by the warm waters of the largest ocean in the world, but we have to warn you that to get to some of these beaches you’ll have to work it like Indiana Jones,” said the article. “The Marietas Islands are made up of two islands and two islets surrounded by natural rock formations that seem to encapsulate the turquoise-tinted water. It’s as if they wanted to keep this place a secret only for those brave enough to uncover its treasures,” it continues. It also mentions a protected area that encourages adventure and exploration via scuba or snorkel, where visitors can even practice their mountain climbing skills! Regarding Platanitos, it waxes eloquent about its calm waters that allow swimmers to remain in the water without having to worry about jumping any big waves. The beaches of Michigan in Guerrero, Playa Mermejita in Oaxaca and La Llorona in Michoacán round out the list. This website has more than half a million followers on Facebook. It’s part of one of the world’s most famous brands of mineral water. The global site is published in over 10 countries, with readership in many more. This article is just one more example of the growing interest of the world at large in Mexico’s Pacific Treasure.